Does God warn His people today in supernatural ways? God speaks to His people in dreams, visions and words, and He most often communicates through His word in the Holy Bible. It is important to read the word daily because Elohim wants to communicate with us directly. We are about to enter difficult times ahead and we as believers should not to be surprised when disasters come because there has been plenty of warning given. The Almighty does nothing without first warning His prophets (Amos 3:7). We know that God warns His people before big events are to take place and warning His people before the judgement happens is a signature trait of His. He allows us to know these things in advance so we can act upon them. 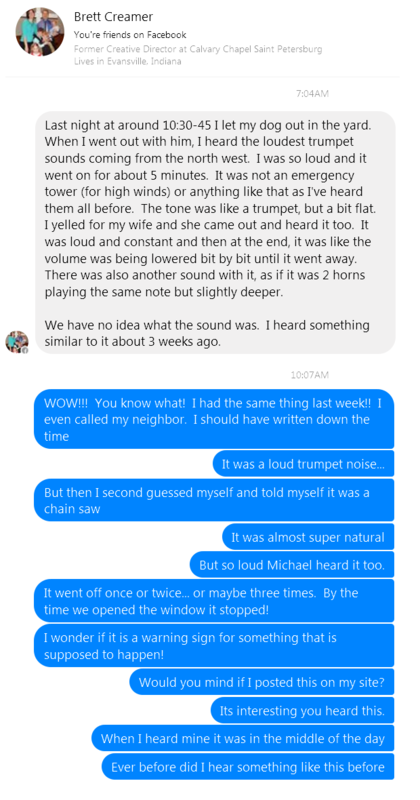 My friend Brett Creamer emailed me this morning about a supernatural trumpet he heard outside on the 22nd at about 10:30 at night. What is remarkable is I also heard a trumpet sound about a week ago. I was located in our basement and called to my husband upstairs who also heard the same noise. I immediately phoned my neighbor and asked him to open up his window, but by the time I talked to him the sounds ended. This took place in a span of 3 minutes or so. My husband Michael Snyder can also testify to hearing something. It was almost like a series of blows that had a supernatural ring to them. I haven’t ever heard this call before, and it very much sounded like a trumpet, but later we wrote it off to someone running a piece of machinery around our neighborhood. 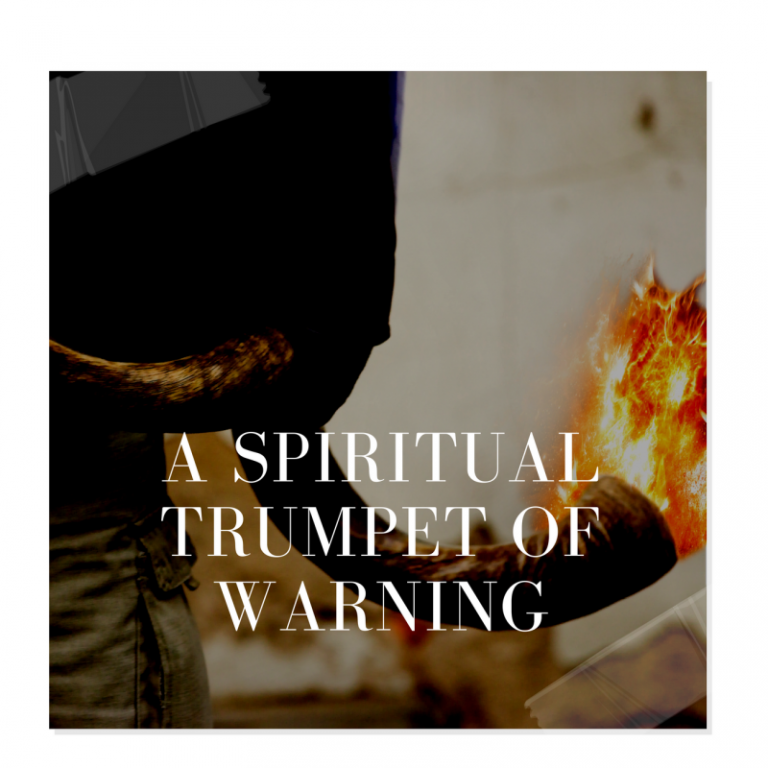 With Brett’s email, it may have been what I originally thought- A trumpet warning. Sometimes we second guess ourselves, but usually our original gut instinct is often correct. When I first heard the sound, I believe I heard a trumpet. God can use supernatural ways to reach us, not necessarily because we personally are in danger, but to make us aware of something that is about to take place. What we need to do is start praying that any judgement that is about to be sent, would be LESSENED in severity. We know that judgement is coming for this country, but the magnitude of severity can be reduced in size. Brett does hear from God. He has seen the coming military invasion in America and the tsunami that is also coming the east coast of the United States. While none of us know the timing of these events, we should be praying about them. I personally think judgement is set for this country, but it can be lessened. Pray that God would move His people out of these danger zones, and pray for those who are innocent like the children who are going to be caught in it. We also don’t know the timing of the trumpet warning. It could be a month from now, a year from now, or something that happens quite soon. We can only speculate. A warning is to get prepared. EARTHQUAKE!M 4.2 – PUGET SOUND REGION, WASHINGTON ,M 3.4 – SANTA BARBARA CHANNEL, CALIF! James Bailey wrote a recent article about the late John Paul Jackson’s prophecy that described a significant storm that would precede the major shaking in California. Read it here. We know John Paul Jackson is a tried and tested prophet of Elohim. A 2,000-mile long Super-Soaker storm, which is now arriving in California, might be the fulfillment of a prophetic warning. For many years, there have been warnings about the Big One hitting California, a great earthquake that will permanently change the landscape. However, through prophetic words, God has promised to send a warning sign preceding that terrible event. In the following 91-second video, the late John Paul Jackson describes the warning sign as a significant storm that will hit California. He was not shown what kind of storm, perhaps a hurricane or something else. The video was recorded in 2013. It just so happens that since New Year’s Eve, there have been more than 250 earthquakes near the border between California and Mexico. These quakes appeared to be centered around the town of Brawley, which is only about 30 miles away from the San Andreas fault.